Discover how cricket chirps can tell us the temperature, why you can’t unburn a match, why ice floats, and a host of mysteries of modern living — including some riddles that maybe even Einstein couldn’t solve. From the simple (How does soap know what’s dirt? How do magnets work? Why do batteries die?) to the more complex (Why does evaporation have a cooling effect? Where does uranium get its energy? 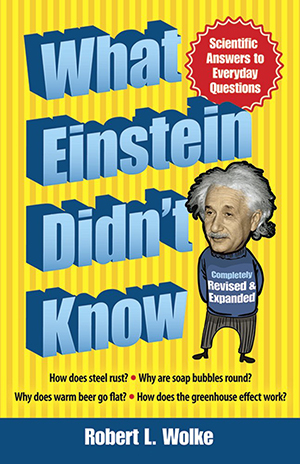 ), this book makes science more understandable and fun. Now available at Amazon and bookstores everywhere.